Don Whatmore's daughter Renee Mead is having a memorial on Sunday September 9 at 12:30 at Elliot Bay Marina in the Alani Room. 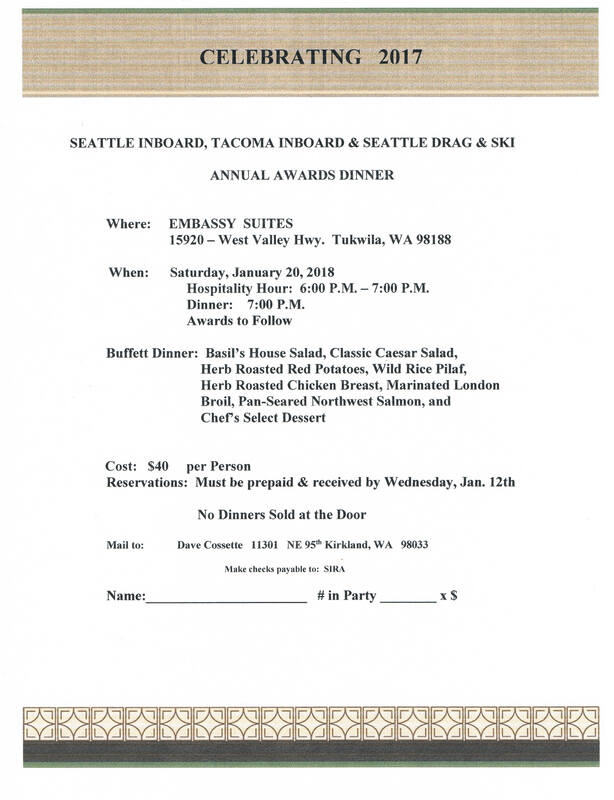 You and other members of the Seattle Drag and Ski Boat Association who remember Dons's Circle Boat Racing days are invited.Could you also furnish us each a list of members and I will try to research addresses or phone numbers for her. Renee Mead may be reached by you at 206-595-0235 and at mead.family@comcast.net. I will send her a copy of my E Mail to you so she may keep in touch with you. Jim thank you for your help. Bobby Wolford and Mick Santa and I will for sure be attending and I want Bill Wolstad to show with others I will try to contact. Dutch opened the meeting with reports from several races. These included Black Lake, Rocky Fork, Cambridge, and Tri Cities. The reasons for why Dutch approved the sanction for Caesars Creek opposite Lake Hopatcong was given. Date was already on the calendar, Not many boats that are on at Caesar Creek were at Lake Hopatcong last year, need to rebuild racing in Region 6. Dutch asked about inspection equipment for both Evansville and Hampton. He was assured the respective Regions have what is needed. Dutch put out a plea to all on the call to have everyone get their registration in early for our Championship events. A motion was made/seconded to eliminate rule 11.3.1 regarding unqualified rookies racing in a final for a Championship race. After discussion the IRC voted unanimously to eliminate the rule. Dutch had already spoke with Howie about this and it looks favorably that this will pass the BOD and put in place immediately. Discussion took place regarding the 2 proposal already submitted regarding conflicts in race dates. Dutch proposed a 3rd. There was much discussion regarding this topic. Overall, all agreed that we need to do something. It was decided that this would be tabled until we could meet in person and discuss it. Dutch announced that the 2019 Rule Proposal form is out under Resources on the APBA web site. He encouraged all to get proposals in early. Discussion also ttook place regarding the non APBA race in Long Beach and the accident that took place. Prayers were asked for the driver who was seriously hurt. This resulted in further discussion about the Unlimited Race in San Diego and it having non APBA racing as well as APBA racing. Dutch will look into it. Also discussed was an experimental engine that was being tested on the East Coast in a school boat. The engine is a 1.9 Ford engine. It is believed to be a Ford Focus engine. A motion was made and seconded to approve this engine as an experimental engine in the T class for this year. This passed unamininously. The meeting was adjourned after closing discussion about the National Meeting next February. Because of a recent upgrade the website will have to be redone. Check back every so often to see any changes that have been made. Be patient as my time is very limited to work on this. As we are at the end of the month, we wanted to send out a few reminders to everyone! - Also, we all ask that you have respect for the cars and projects in the shop. They are welcoming us into their space so, please no touching. These are people's prized possessions and truly works of art so let's keep it to eye candy! Thank you in advance for cooperating! Also a big thank you to Gary Dahl for helping put this all together! Next, I have attached our club membership forms for 2018 - if you have not yet, please fill out and mail back or come fill one out at the meeting! We are thankful for the support of our club members and are excited to make next year even better! Lastly, this is copied from an email from Cindy White and the Region 10 Rescue crew about capsule training! Make sure you pre-register to save yourself some money and help these guys out! They do so much for us, all they ask is for a little heads up! Please share this everywhere you can! That's all for now - thanks again to everyone and hope to see you on Wednesday! Hello everyone and Happy Holidays from all of us at Seattle Drag & Ski! First off we wanted to share how genuinely thankful we are for all of our club members for your support, participating, and effort made all year long - on and off the water! This boat race community is truly one of the best and we so grateful we get to spend our summers together! Coming to the end of the year also means it is time to renew our memberships! 2017 was a great year for our club and we are looking forward to 2018 being even bigger and better! We have been working on lots of ideas on how to further our club and make some awesome experiences for our members and race community! We hope you are excited to continue on with us for the new season! I have attached our club membership form, if you bring it to our general meeting on Wednesday, we will give you a drink ticket on the club with you complete your 2018 membership! You can also print it out and mail with a check to the address listed! As I am working hard on updating our clubs records and filing systems, please fill out the form for the new year and also update any changed information from last year! Speaking of our general meeting - that is this Wednesday, December 6th, 2017 at The Golden Steer in Kent. 6pm for dinner and conversation and meeting at 7pm! Not only is this our last meeting before the new year, our first meeting with our newly elected board members, but it is also our Christmas meeting! Come help us celebrate with a drink on the club! One of our favorite traditions for the holidays and great way to finish off the year! We will do a quick recap of last year and go over some great info for next year! I thank you all again for your continued support of our club and look forward to the next season with all of you! Welcome to the New Seattle Drag & Ski Sprint Boat Association web site. Our Club is a very diverse Club. Our membership covers entry level Flat Bottoms (Sportsman Entry) to top level Flats (The "K-Boats" ); the smallest hydroplanes (1 Liters) to the largest & fastest of the hydroplanes (The Unlimiteds); a new and very active group known as the Vintage Racers; and our Safety & Rescue members (without whom the sport of organized boat racing could not happen). Rounding out our membership are folks who simply enjoy boat racing so much they become worker bees on our racing weekends; helping as crew members, race committee staff, and safety and teardown. trailer racing start at 6pm; the general meeting a 7pm.